With all these "Ultra-Super-Mega-Premium" vodkas that are $50 a bottle and other liquors trying to see how much they can charge you, can't a playa get something on the cheap side that'll be drinkable and get you good and hammered? Kool Aid Wine to the rescue! This isn't a mixture of Kool Aid and some clear spirit, no sir! 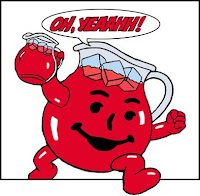 It's Kool Aid that is actually fermented and ready for you to either a) make you happy or b) make you go blind. 4L jug or two 2L soda bottlesa fairly long piece of thin rubber hosea funnela measuring cup1 balloon1 rubberband1 pinAnd the fun just keeps on coming! Anything that uses a thin rubber hose and a funnel is a-ok in my book. So, how do you save Starbucks now that everyone is serving coffee that's pretty good and making fun of Starbuck's for still charging you 4 bones for a cup? Well, take away the logo, take away the marketing, and then start serving booze. Starbuck's is taking one of their stores in Seattle that was supposed to be closed down and turning it in to the very thing they put out of business, a nice, local coffee shop. Also, one that's going to serve wine and beer. Keg stand competitions may be in the works (I'm just kidding. No, I'm not. Yes, I am). I'm already getting my drink order ready: "Yes, I'd like a half-caf, double-decaf, no foam vodka Red Bull with a twist of lemon and 3 cubes." Three O Vodka is pulling out all the stops. They got Kim Kardashian to launch their latest vodka and even found a clever flavor to launch, Bubble Gum. You know what this means: The entire world of drunk college girl shots is going to really take-off now, because those same girls are just so over watermelon shots and Purple Hooters. Considering how amazing I am at mixing stuff, I'm sure that I could find some way to make this awesome. Like...I could put it in ice and shake it and serve it in something pink. Or I could I could put it in a tiny glass with a single pink ice cube. The options are endless! 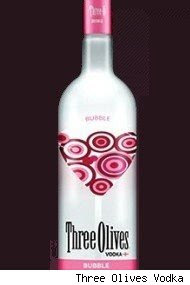 Three Olives Tomato Vodka is great for Bloody Mary's. The Root Beer one is fun to make a few things with. I'm wondering how this one will really do.